Established in 2009, Hodgkinson Street Mepham is a civil litigation defense law firm located in Portland, Oregon. 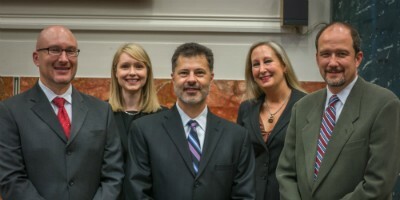 Founding partners Jeff Street, Martha Hodgkinson and David Mepham, partner Brad Piscadlo and associate attorney Tracy Hooper and Abby Miller have nearly 100 years of combined litigation experience to serve clients throughout Oregon and Washington. Hodgkinson Street Mepham was founded on the philosophy of providing highly personalized legal services in a collaborative environment. Our dedicated attorneys work together on most of the cases we handle, each bringing his or her unique expertise to provide optimal representation, along with the efficiency and skills of highly experienced attorneys. We have the privilege of representing some of the top healthcare organizations, medical professionals, corporations and individuals in the Pacific Northwest. We have the utmost respect for our clients and their dedication to their professions, and we defend them accordingly—with an aggressive and disciplined approach to their representation. We are among the most well-respected medical malpractice, construction defect and mediation law firms in the Pacific Northwest. Partner Jeff Street has been defending doctors and health care providers against medical malpractice lawsuits for nearly three decades. Partner Martha Hodgkinson is recognized by her peers as one of the top construction and real estate litigation attorneys in Oregon, with a focus on both litigation of these claims and resolution of claims through arbitration and mediation. Partner David Mepham emphasizes medical malpractice defense and also defends a variety of corporate clients in personal injury claims, especially those involving catastrophic damages. Our attorneys are consistently named to the region’s “Best Lawyers” and “Super Lawyers” lists. In 2015 Jeff Street was named Medical Malpractice Defense Lawyer of the year by Pacific Northwest's Best Lawyer Magazine - a peer selected honor. Our primary goal is to achieve the best possible outcomes for our clients. Although some cases are resolved by settlement, many are not. We welcome the opportunity to take those cases to trial. Hodgkinson Street Mepham attorneys have tried more than 250 jury trials and arbitrations throughout their careers.